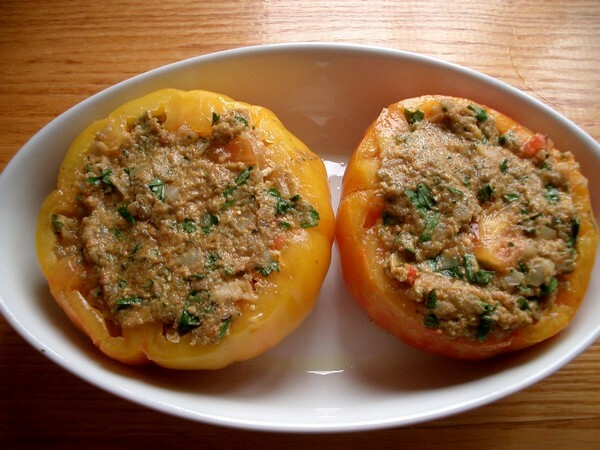 Even though my friend Ivan will be rolling his eyes about another tomato recipe–poor guy he’s in Texas (need I say more? ), the Accidental Locavore is working through piles of tomatoes, trying to take advantage of all their goodness! 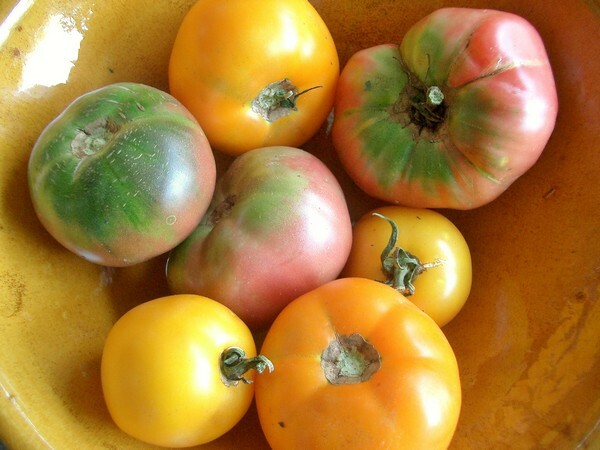 There is very little that can beat a fresh tomato, perfectly ripe and smelling like the essence of summer. 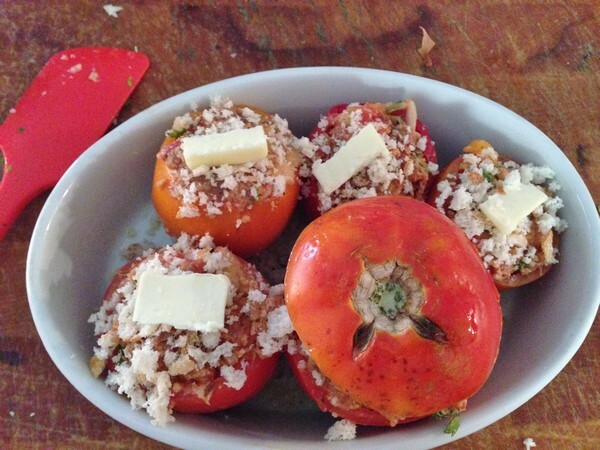 While most of the time, I’m content to just cut them up and toss into a salad, or mix with some local mozzarella and basil from the garden, occasionally the Locavore yearns for an old French favorite, stuffed tomatoes. Now, I’m not talking about breadcrumb stuffed tomatoes, or a tomato gratin, but what I fell in love with in Paris so many years ago, the sausage stuffed ones you find in every boulangerie in the summer. It’s one of the key recipes I look for when perusing French cookbooks, rarely found. Even the Internet, that seemingly inexhaustible source of information, has been less than forthcoming. That’s actually not true, it’s just that none of them are the “right” recipe. Slice off and reserve the tops of 4 firm tomatoes. 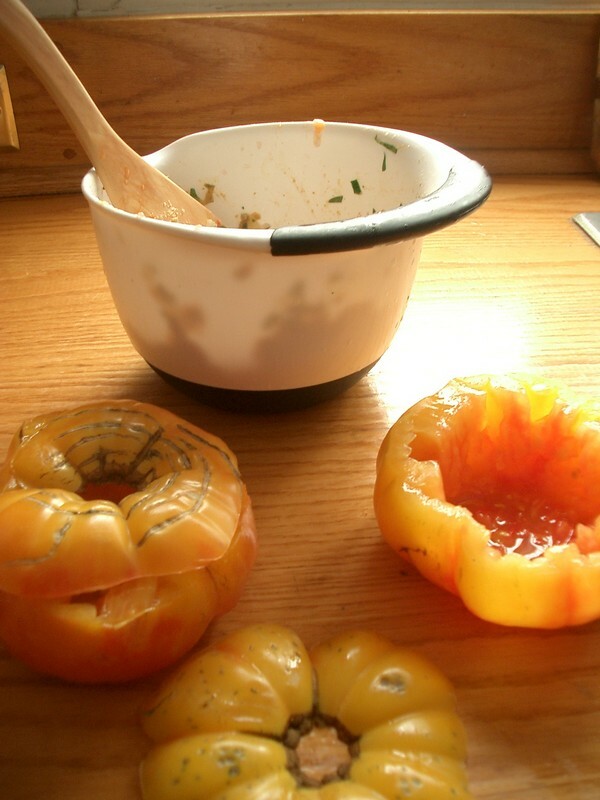 Scoop out the centers of the tomatoes and reserve them, discard the seeds. Warm the butter in a medium sauté pan, add the onion and garlic and cook over medium heat until soft (but not browned), about 5 minutes. Mix together the sausage meat, bread crumbs moistened with the juice from the tomatoes, the sautéed onion and garlic, the tomato centers and parsley. Stuff the tomatoes with the mixture, sprinkle them with fine breadcrumbs, dot each with a small piece of butter and replace the caps. Bake in a lightly oiled baking sheet at 300 degrees for 35 minutes. Serve and enjoy! My verdict: The tomatoes tasted good and we ate all of them, however they’re not quite French enough. Because I tried to get a finer grind on the merguez, there wasn’t a noticeable textural difference between the sausage and the breadcrumbs. Next time, I’m going to use a good pork sausage, maybe even a breakfast sausage. Panko breadcrumbs might be an interesting substitute for the standard ones, or I’ll just pull out the food processor and make my own. Unless my husband decides he’s had enough stuffed vegetables, there’s still plenty of time left to perfect this. Stay tuned! Update: This batch was with some homemade (regular) merguez and while they’re fine and spicy, it’s not the traditional way I remember. It really needs some good pork sausage, even a breakfast style would be ok as long as it wasn’t too sweet. I’m also thinking that maybe some toasted pine nuts would give a bit of a crunch, which would be nice. Because you don’t need to have super-ripe tomatoes, and they’re baked, you could get away with them even in the winter. Previous post: Contest: Win a Wonderful Box of Goodies!